carly tee: watercolor christmas cards with the new essentials by ellen! 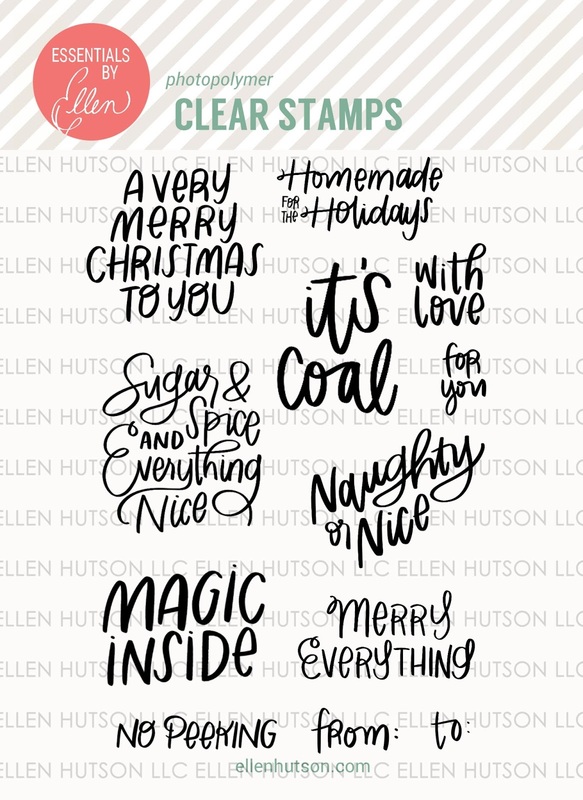 watercolor christmas cards with the new essentials by ellen! The newest Essentials by Ellen is available today and we are hopping to celebrate! You should be arriving here from Amy Yang's awesome blog! Isn't her coloring perfect?! I love her work so much! I love this set - the sentiments are adorable and Brandi's lettering is perfection! I suspect this set will feature heavily in my holiday crafting! I paired the No Peeking sentiments with the new Modern Christmas stamps & dies by Julie Ebersole and apparently I was in a dreamy, watercolor mood when I made these cards. All mint and pink! For the watercolor trees I used a MISTI technique by Lydia Fiedler that she calls marbling with the MISTI. You stamp the base color and then use plastic (food wrap, gloves, etc) to add more colors of ink to the stamp and stamp again. I'm totally digging this technique (see this post for more). I also made my own mint green & pink glitter papers because I didn't have any on hand, shameful I know. For the diy glitter paper, I gave a piece of white cardstock good coat colored pigment ink, topped with WOW Clear Sparkle embossing powder and ta-da! I know my pictures don't do it justice but its such a yummy sparkle! Thanks so much for stopping by! Head over to Lisa Spangler's blog next and prepare to be knocked out of your socks! Lisa's tags are so beautiful, bright & happy! Very nice bundle of cards ! I love the C&S look and the pastel colors, no so usual for Christmas and it's nice to change a little bit ! Carly what a fabulous set of cards and that IS a great technique. I love the no peeking set too, ,I could def. see myself using that one a great deal. TFS! Love the mint green and pink variation of Christmas colors! And the simplicity of the card designs. Thanks. Love these! I saw your cards first on Instagram and was already so impressed! I haven't tried the technique you are talking about, but I now I need to! Love the "reproducible" card design for the holiday. So cute and simple to reproduce. Love your minty green. These are wonderful sentiments. I can think of lots of uses. Thanks for sharing. OOOOHHHH!!! FABULOUS!! I love the pink and mint green , I have always liked non-traditional colors for holiday art and yours is perfect😍!! Thank You!! These are wonderful! I love the clean designs and delicate backgrounds. Beautiful cards, love this stamping technique too, thanks! Really wonderful cards and I love the technique! Sweet set of cards! Love the holly and trees! This is a cool watercolor technique, and I love your homemade glitter paper idea too! Love these. Bought the $et and the dies because of you!!! right at home abstract florals = unicorns? a card & a treat box in one! hopping with Honey Bee Stamps!